As the snow begins to melt, and the temperature rises above freezing, spring prep is in full swing! I got off to a late start this year, but in any event, I thought this would be a great way to leap into spring wear! One of the great things about having or being part of a sewing group are inspirations. 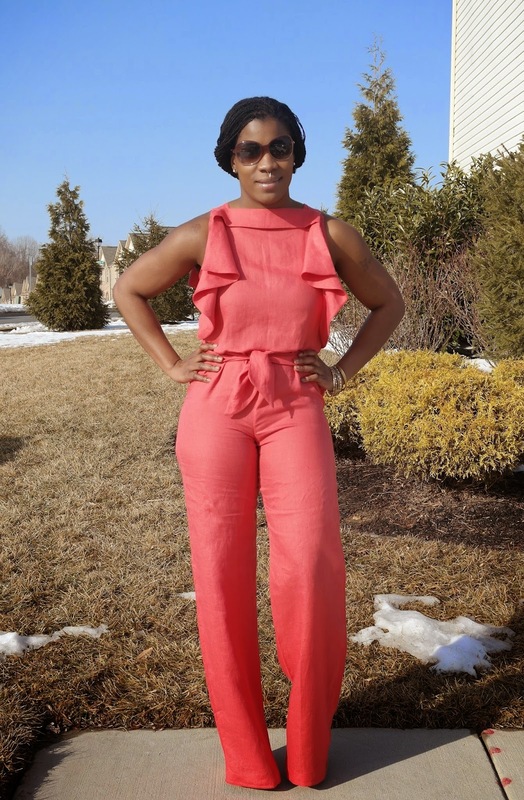 There is no question, I live for jumpsuits! Because of this, I jump at every opportunity to recreate or design jumpsuits that are unique in their own right. 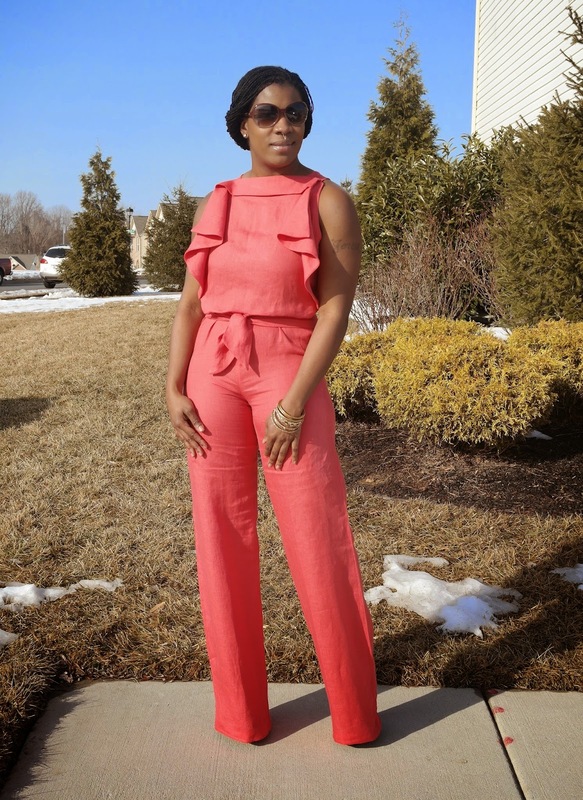 The inspiration for this jumpsuit came from Escada's Spring 2015 line. 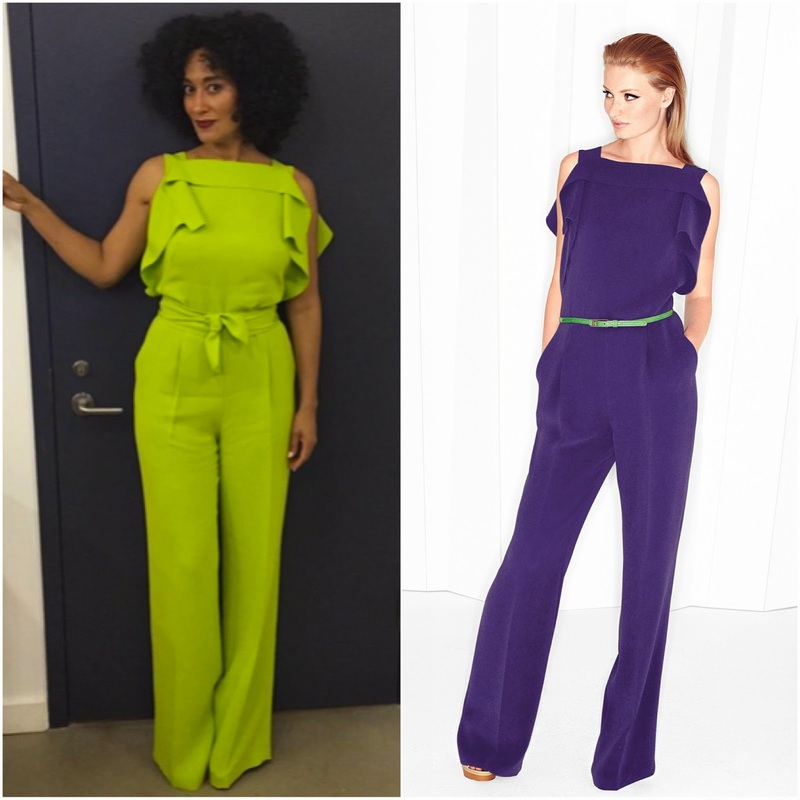 An actress (Tracee Ellis Ross) wore the jumpsuit in green and I was instantly in love. I could not think of any patterns that I could use to recreate the top of the jumpsuit, so I decided to draft a pattern by draping on my dress form. The bottom of the jumpsuit is a drafted wide leg pant from McCalls 6930 (my go to sloper) for a close fit. I choose 4 yards of a Coral, light weight linen from Fabric Mart. The color option is no longer available due to a recent sale, but other options can be found (HERE), (HERE), (HERE), & (HERE). I took the first night of this process draping muslin on my dress form in order to accomplish the perfect drape to the flounce on the side. I had no intentions of putting darts anywhere on this jumpsuit, so this process was completed fairly quickly. I draped only one side as the bodice and top flounce were to be cut on the fold. I was able to use these three pieces for the front and back pattern pieces. This is only the second time I have draped muslin for a garment. The first time was so successful, I had no doubt I would be able to come up with a great concept to achieve this look. This was one of those times when YT and Craftsy were my best friends. I would watch draping videos over and over again! Once I completed the muslin pieces, I was able to proceed as usual. This project can be completed within a matter of 4-5 hours start to finish. I am all about projects that I can start and finish in the same day, so I was pleased with how quick I was able to get through the entire process. I was not able to find this jumpsuit for sale anywhere, but less complicated pieces from Escada are currently for sale for over $1200... Total cost for you to make this yourself????? Less than $50!!! It's beautiful! Your creation is spot on. Perfect fit and great color! That is stunning! Great job on the draping to recreate your inspiration garment! The upper half looks great, the pants.... not so much. The crotch is too short. Beautiful! So creative! Good job! That's perfect on you! Great drafting and a damn perfect color! Thanks all. I am happy with the way it turned out. That jumpsuit is on point!! Rock it!! Wow, amazing! I'm impressed with your creative problem solving and of course the end result is fabulous.